After a brief hiatus, the Car-Free Sunday SG initiative will return this weekend for another six months, with more roads to be closed for use by cyclists, joggers and pedestrians. The monthly programme, which was piloted from February to July, will be expanded from the Central Business District (CBD) and Civic District areas into the Telok Ayer conservation area. The second instalment of Car-Free Sunday will be stretched to 5.5km from 4.7km previously, with additional road closures affecting McCallum, Amoy, Boon Tat, Telok Ayer and Stanley streets. Announcing the news yesterday in a blog post, National Development Minister Lawrence Wong said the pilot had drawn "tens of thousands" of Singaporeans, and a lot of positive feedback. He said many people had asked for the initiative to continue, and for the car-free route to be expanded. "Car-Free Sunday SG is a step towards our broader vision of a car-lite and people-friendly society," said Mr Wong. Under Car-Free Sunday, some roads are fully closed and others partially to provide spaces for the public to walk, jog, cycle and take part in recreational activities, such as mass workouts. It is typically held on the last Sunday of every month. Besides the expansion to Telok Ayer, the Urban Redevelopment Authority (URA) said more roads will be fully closed, such as the five-lane Robinson Road and the four-lane Cecil Street, to create more cycling and jogging lanes. 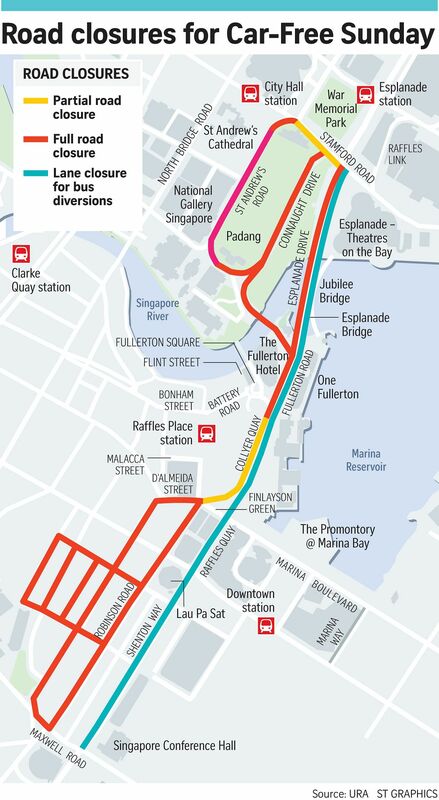 Buses plying these roads will be diverted to Shenton Way, the URA added. Roads will be closed between 8am and 11am. For the upcoming Car-Free Sunday on Oct 30, the public can enjoy free guided tours of the Thian Hock Keng Temple in Telok Ayer Street. There will also be an educational walking trail along Ann Siang Hill and Telok Ayer Green, which looks at the trades and ways of life of Singapore's early immigrants. Cafes in Telok Ayer Street will be open from 8am, in conjunction with the initiative. Ms Cindy Leong, managing director of juice shop The Cold Pressed Station, said: "Our target customers are usually CBD workers, but now we can also reach out to families who are coming to the area." Dr Alexander Erath, project leader of the engaging mobility group at the Future Cities Laboratory research institute, welcomed the expansion to Telok Ayer. He said cafes and shops there will benefit as the roads will be turned into spaces for strolling and hanging out. In his blog, Mr Wong said more community groups have contributed their ideas and activities. One is a "bike train" - comprising multiple bicycles connected in a train-like trail - which children, the elderly and those who are less mobile can take to tour the Civic District. The second instalment of Car-Free Sunday will run until April next year on Oct 30, Nov 27, Jan 22, Feb 26, March 26 and April 30. The URA did not say if it will be extended after April but said the initiative "will run for at least six editions". Pre-school teacher Chia Yi Wen, 25, said she is looking forward to cycling on the roads - which she typically does not do - as it will be free of vehicles and safer. "I also want to check out the activities and performances," she added. Car-free programmes serve a bigger purpose, said Dr Erath. "It's a showcase, so people can broaden their horizons of what a street can be, and how a city feels when it's more people-oriented than car-oriented. It just takes time to build up this culture."